The included instruments are divided into categories. 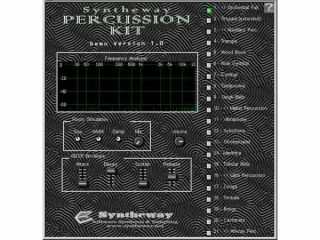 Syntheway's latest plug-in release is a well-stocked percussion library. Percussion Kit features a variety of beatable instruments in several different categories. First up, there's the Orchestral Percussion section - the likes of snare rolls, timpani and suspended cymbals are offered here. Triangles, woodblocks and the like can be found in the Auxiliary Percussion category, while Mallet Percussion is perfect for vibraphone, xylophone, glockenspiel, marimba and tubular bells fans. Finally, there's a Latin Percussion section - congas, timbale, bongos and castanets are present and correct - and an African Percussion Kit. Variable room simulation and an ADSR envelope are also on offer. Available now, Percussion Kit runs on Windows and Linux. It costs $29.90, though you can also download a demo from the Syntheway website.